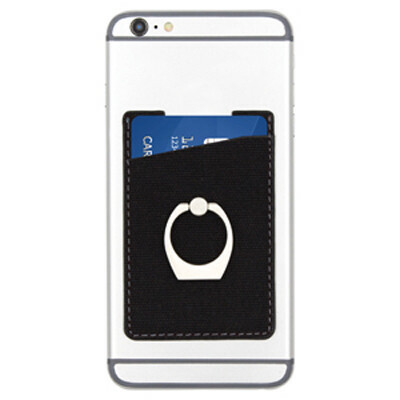 Features: RFID blocking smartphone pouch, holds 2 credit cards and features an adjustable kick stand and finger ring for a secure grip. Easily installed by removing the rear lining paper and sticking onto the back of a phone or flat phone cover. Material: Waxed Canvas.. Certification: RoHS. Product Colour: Black, Blue, Red, White. Product Size: 95 x 63 x 8.5 mm. Print Area: 17 x 6.5 mm. Print Process: Laser Engraved. Delivery: 2-3 weeks (indent) from art approval. Standard Packaging: Black Box. Packing Details: 100 pcs per carton, 4 Kgs, 40x21x16 cms. Setups: Included.